Have you ever had an idea to create something and it came out even better than you hoped? This simple water fountain I created for my balcony garden is the best thing ever! I cannot tell you how much joy it brings me to have it bubbling and gurgling all day and evening. In the process of creating a garden for my balcony, I decided that it would be fun to have a water feature. I had no idea we would enjoy it as much as we do. With a few ideas in mind, I decided to go online and do a little research on DIY portable fountains. That’s when I discovered that Lowe’s carried an all-in-one water fountain kit for containers. Once you get an idea to make something, isn’t it just torture to have to drive all over town to find the parts you need, when all you want to do is to get going on your project?! That’s me, so I was thrilled to see online that Lowe’s had a SmartPond Container Fountain Kit in stock. One left. Seriously, I couldn’t wait to get to the store the next day. I totally loved the idea of purchasing a kit so that I didn’t have to figure out how to make the various parts work together, especially as I have no idea how water fountains actually work. I have to tell you, putting the fountain together was incredibly fun. Our Lowe’s isn’t in our normal shopping area, so since moving back to Michigan, I hadn’t been in a Lowe’s. I have to tell you, this store has an amazing garden center with incredible floral displays, even in mid-June. They have a water feature section in the garden center and there I found the one container fountain kit I needed. Hooray!! With our kit in hand, we decided to see what we could find for our container. I had several ideas in mind, but when we came across this dark turquoise pot, Tim said he really liked it. He went to find a shopping cart and left me happily standing in the aisle still looking at the various containers. As I looked up, I noticed some ceramic fish. They caught my eye because they were cute and a pretty light aqua color. PLUS… I soon discovered they were on sale for $2 and change. Although the shelf tag listed the ceramic fish as a tea light holder (Cover might have been more accurate as it wasn’t capable of holding anything as it had no bottom or top. ), I immediately saw it as the perfect whimsical addition to my water feature. How fabulous would it be to have water spurting out the top of the fish?! And the color was perfect! My water fountain idea was beginning to come together. Now I just needed to figure out how to support the ceramic fish over the fountain. We walked all over the store and the garden center until I had the idea to stack two black plastic pots (small over large) to hold the fish, cutting out the centers to allow for the neck of the fountain to come through the pots. I was so excited. The inside of the pot was black and so everything inside the pot and under the water would be black, too. How much better could it be? This post contains affiliate links. That means if you click on my link and buy something, I may earn a small commission from the advertiser at no additional cost to you. I was so excited to start the project that I went to work on making my water feature almost as soon as I got home. For the most part, everything came together easily. I didn’t exactly time things, but I think I was enjoying the sounds of dancing water in about 2 hours, and that included taking photos of the process. The kit came with thorough instructions and I followed them exactly. Except I cut a hole in the bottom of the pot, not on the side as suggested by the instructions. There was one hitch to the set-up and that was having to go back to the store to get a special drill bit to cut the hole for the plug and stopper. Our container was made with a stopper that I originally planned to pull to install the wiring, but it was centered in the bottom of the pot (and a bit small) so it didn’t work for our set-up. Because I wanted the fountain to be centered in the pot, I needed to offset the hole, especially as the wiring and stopper were bulky and the fountain extension from the pump was not centered either. Truly a small inconvenience. A simpler way to solve the problem would have been to simply drape the cord to the fountain pump over the side of the container. If you don’t have a power drill or want to use one… that would be an easy way to set up a fountain. The kit came with feet that could be glued to the bottom of the pot (I used clear E600 adhesive to attach the feet.) which raised the pot just enough to allow for the cord feeding out from the bottom of the container and the stopper that stuck out a bit. After cutting the sides and tops of the black plastic flower pots that I chose to go over the fountain housing to hold up the ceramic fish and allow for water flow, the power cord, and the fountain extension tube with water spray nozzle, I assembled everything. Then I had Tim push the stopper holding the electrical cord into the hole I drilled into the bottom of the pot. I tried, but the stopper is quite stiff and I wanted to be sure it would be secure, so he gave it the necessary muscle. It was then time to fill the container about 2/3 with water before plugging in the fountain. Do not turn it on without sufficient water covering the pump. The kit comes with 3 styles of fountain heads. I chose the water spray nozzle insert thinking that a pretty cascading fountain of water would be fabulous coming out of the fish. It would have been if my container had been much larger in diameter. It was beautiful, but it over sprayed the sides. I tried the other fountain heads, but they were not quite what I wanted for the fish. After taking a second look at the spray head, I decided to give the center a little twist, and by doing so, the fine spray stopped and instead I got more of a spurting effect. It was perfect! The water still shoots and dances a bit over the top of the fish, but it doesn’t splash outside the container. I couldn’t have been much happier. Except that it seemed that my fountain was leaking. I positioned a small plate under the fountain to catch the water. It wasn’t something I wanted to do in the long run, but I wasn’t eager to dump about 5 gallons of water and go through the process of having to seal the stopper to the container. My procrastination paid off! On the third day… the fountain ceased to leak any more water. And it’s been dry ever since. For nearly a month, we have been enjoying water music in our garden. Now, it’s even MORE fun! We love how the fish get excited and gather up when they hear us open the slider and our little neighbor LOVES to come up and feed them. One thing that I don’t like about living on the top floor of our apartment building is not having a connection to the land. As a gardener… that’s a big deal. Being able to create a garden with a water feature on our small balcony has truly made all the difference. I love having the slider open on the nice summer days and evenings and being able to listen to the soothing sounds of our water fountain in the midst of all the pretty plants and flowers. It really is a little oasis… high up in the treetops. This is my first water fountain. We have talked and dreamed of having ponds in our various gardens, but we didn’t have or want fences around our yards, so without some engineering, ponds stayed in our dreams. Isn’t it just like God to bring a dream to reality when we’re living in the in-between? This is my view of the container water fountain from my breakfast table. It’s such a lovely way to start my day… beautiful plants… gurgling water… and feeding happy goldfish. Do you have or have you ever created a water feature or water fountain for your yard, garden, or patio? If not… you’ve got to create one, too! It’s such a reward for a wee bit of effort and a fun creative endeavor too. P.S. This is not a sponsored post. I just wanted to share my joy of having a water fountain and how I made it happen, so you can make one, too. Thank you for your kind words about my projects and my blog, Judy! You just made my day!! It’s amazing how listening to moving water is so soothing. I love that you have a fountain in your garden room all year long. What a wonderfully peaceful spot for you to enjoy. What is the saying? Where there is a will there is a way?!! Now this would not be so fun without that darling fish!!! Totally love the color and the plants surrounding it! Plus the fish 🐟. We have a large fountain with a flat back. I do believe the pump is out but we have not fixed it because of water restrictions. Now that we are so restricted, the city has decided to also raise our rates nearly 70% by next year. To get rid of some toxin done by a company still in business–done in the ’70’s and ’80’s. Outcry!!! So to see your sweet fountain does bring me joy. Thank you for letting me know a small fountain kit is also an option! 70% increase!! That is so wrong and I’m so sorry. The kit is just $20 and could easily be rigged for other situations. Wouldn’t it be fun for you to enjoy a water feature again?! I love how you created your own, unique water fountain. The goldfish are a great addition! Thank you so much, Ann! We absolutely love it! Your fountain is delightful. I love the sound of water bubbling is so soothing and the little fish is charming! Thank you so much, Lisa! I have to tell you that I knew I always wanted a water feature, but I had no idea that I would enjoy it so much. 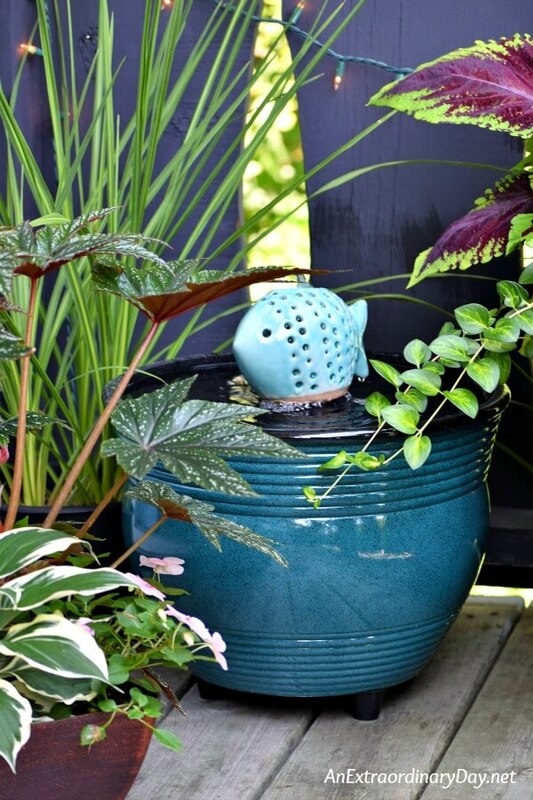 I love that you have created this little garden space with this lovely little fountain. You provided a perfect tutorial, your step by step directions are very clear. 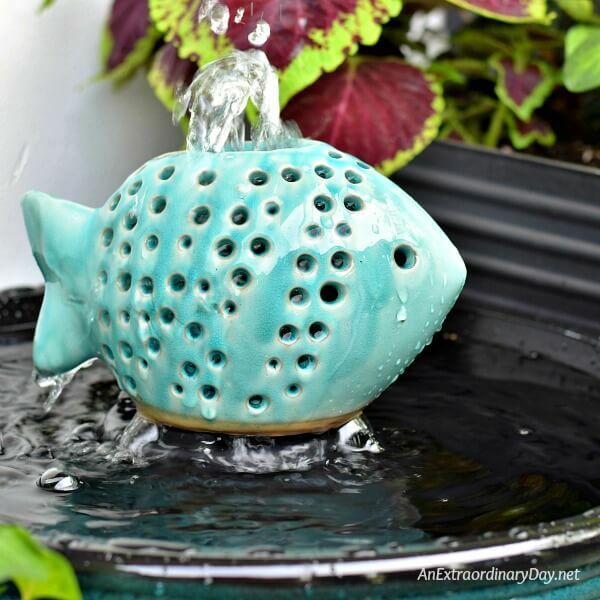 I would love to have a little fountain like this with the goldfish, but that is a challenge with the heat here in Florida. Thank you so much for sharing your fountain at Celebrate Your Story! Hey, thanks for sharing your Water Fountain project at Inspire Me Monday. I wanted to let you know that you are one of my featured picks this week. Come check it out at http://www.farmhouse40.com/inspire-me-monday-140. See you there.